Would definitely recommend as a covenient location to Currumbin. 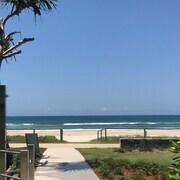 Great location between the highway and the beach with views across Currumbin Alley to Surfers Paradise. 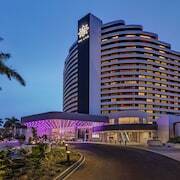 The Royal Palm Resort is an older facility but the location is terrific, being right on Palm Beach and just up from the Currumbin alley. The staff were very friendly and accommodating with prompt service. The room was clean and the bed/pillows are very comfy, but the bathroom is dated and the couch was lumpy. Minor inconveniences considering the positives. We had a high ocean view room and the views did not disappoint. Great location too. Only a quick stroll to all the restaurants, shopping and grocery stores. We enjoyed our stay. The layout of SeaWorld resort is terrific. I thought there would have been a general store on the premises. We had to go into Surfers just to buy general bits for our holiday eg breakfast cereal for a child. We found that we had to eat at the resort which was great for adults, not so great for kids, in the buffet for dinner the only kids food was party pies and penne bolognaise, neither of which are eaten by my grandson. We ate in the al acarte eatery after the first night, which had a better selection for kids. Overall we enjoyed our stay and will come back again knowing what to bring with us. Stuff your suitcase and prepare for new adventures! 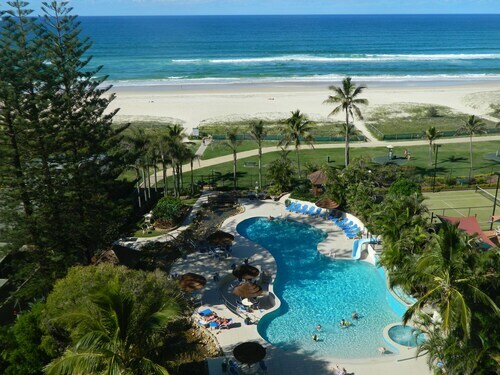 When you use Expedia.co.nz to reserve a room at any of the hotels, motels, or resorts in Currumbin, Gold Coast, you’ll save time and money. 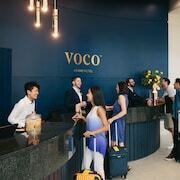 Our massive selection of over 1816 accommodation options makes it simple for you to find incredible deals on local hotel options, whenever the urge to travel strikes. 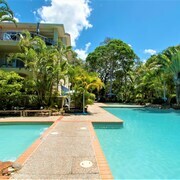 Besides our unbeatable rates on rooms, you can keep even more of your cash and streamline your plans by combining your Currumbin accommodation with your plane ticket. You’ll score the best possible prices when you bundle your travel arrangements into one package, and be able to hit the ground running as soon as you arrive. 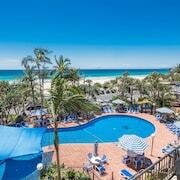 At Expedia, we don’t just offer outstanding deals on our trips to Currumbin, Gold Coast. We also give you a range of offers to help you plan a cost-effective trip, no matter where you’re going. Not only will you find a variety of incredible holidays on Expedia.co.nz, but if you see a better rate elsewhere, we’ll match the deal or provide you with an equally attractive alternative. Right here on Expedia.co.nz, you’ll find trusted hotel reviews written by travellers who’ve been to the hotels you’re considering, so you can find out exactly what to expect before you book. 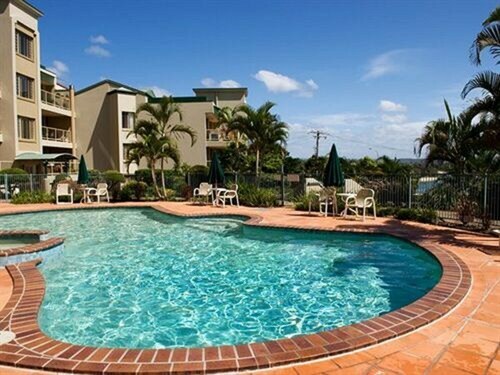 Our ever-expanding collection of reviews provides you the top tips and inside information you need to have the Currumbin hotel of your dreams. You can even look at extensive photo galleries and take virtual tours to see it all for yourself. 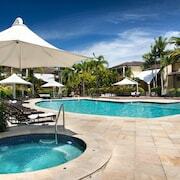 Sign up for an Expedia.co.nz account and you’ll gain access to the most competitive Currumbin hotel deals. Plus, when you become a member of our exclusive Expedia+ VIP program, we’ll offer you even more specials and extras to help you enjoy your stay in Currumbin. From free drinks to discount spa treatments, our VIP options ensure you’ll have a first-class stay. 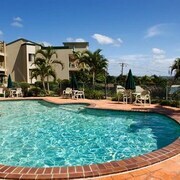 Why wait another moment to book cheap hotels in Currumbin, Gold Coast NZ$101? 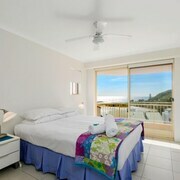 Start searching for the ideal accommodation right now, and you’ll find the perfect choice in minutes. 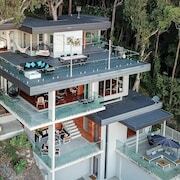 Explore Currumbin with Expedia.co.nz’s Travel Guides to find the best flights, cars, holiday packages and more!